Original Content: No Vampires, Werewolves, Fairies, Zombies, Or Any Other Paranormal Beings. Just Real Kids In A Good Book. No Vampires, Werewolves, Fairies, Zombies, Or Any Other Paranormal Beings. Just Real Kids In A Good Book. Summer for teenagers is supposed to be a fantasy of dream jobs in dream places with dream people. Teenagers know that because they've read it in books. 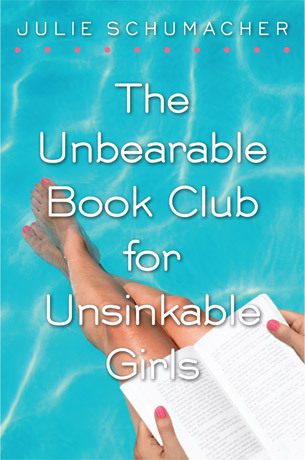 In reality, summer is frequently far more like what the four characters in The Unbearable Book Club for Unsinkable Girls by Julie Schumacher experience. They're stuck in town without their friends because that's the way things fell into place. They're injured, like Adrienne, The Unbearable Book Club's main character. Or they're in trouble with their parents, like CeeCee the well-to-do snotty girl. Or they're high achievers working away at their ho-hum summer jobs like Jill because they have goals they're going to meet. Or, like Wallis, they're from families in which teenagers don't get to do any of the fantasy dream stuff that shows up in YA books. I guess I would have to say that this book is basically about four girls without much to do who are thrown together for the summer. The frame for the story is the AP English mother/daughter book club that three of the girls' yoga-loving mothers put together for them. Over the course of the book, the girls read four novels that scream AP English. ( I had an AP English student living in my house not too long ago. Yes, he had to read The Awakening, just as these girls do. ). Bits of the books relate to what's happening to the girls in The Unbearable Book Club. It could be argued that not much does happen to them, which, to me, is in large part what makes this book so believable. Lots of times, not much happens to us. Schumacher writes about not much happening very, very well. And yet someone dies in this book. As Adrienne says in her introduction, "Book clubs can kill you." Adrienne is a marvelous character because she's having a rough summer in which she does modestly unsavory adolescent things without a whole lot of justification for her behavior. That happens. Okay, sure, she's never known her father, but why pick this particular summer to let it get to her? Because a bottle of gin just sort of fell into her lap. And, yes, that's how things happen in real life. I loved CeeCee because she's the stereotypical mean girl, but she isn't. Over and over in books and movies I see that same cliche. Here the cliche gets a working over. CeeCee reminded me of Dalia in Suburgatory but way smarter. She has a sophisticated wit. Don't believe she could get into AP English reading just the summary of books on-line, the first couple of chapters, and then the end? I've known people who got through college reading like that. And they did well there. It can be done. This is a marvelous, mainstream novel that could be another crossover book. I'm surprised it didn't get nominated for a Cybil or for one of the Goodreads awards that are being voted on now. I've just read that Unbearable Book Club's author wrote an earlier, adult novel, The Body is Water, about Adrienne's mother sixteen years earlier. I love the idea of using characters in two different books, even in two different genres. Interesting. I had just today read this article (http://www.achuka.co.uk/achockablog/archives/2012/11/reality-returns.html) at Achockablog. A turning point in YA perchance?